The idea of using computers to improve healthcare began to be discussed in the 1950s. The electronic medical record, hospital information systems and telemedicine have been pursued for some decades now. 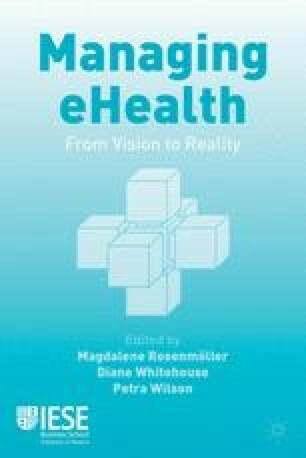 eHealth, a term in use since 1997, describes the use of digital services throughout healthcare. However, healthcare systems whose information exchange is fully computerised remain the exception. Healthcare social media is giving new life to eHealth with the introduction of opportunities for individual initiative, user-generated content and the exchange of experience through a wide variety of online communities and applications. Some of these are grassroots initiatives on Twitter and Facebook. Others are developed on individual websites and mobile platforms. These services are typically intended either for health professionals or for patients and consumers, and too rarely enable collaboration between professionals and patients. The ideal scenario would be to have fully integrated programmes that connect diagnostic and learning tools, clinical data and user experiences to bring about the best interest of patients everywhere. Silber (2003), The case for eHealth, EIPA, http://www.epractice.eu/files/download/awards/D10_Award1_Resear chReport.pdf.